Just a few miles from Lake Champlain, WhistlePig Farm in Shoreham, Vermont is a small family business that’s making some very impressive rye whiskey. In fact, WhistlePig is poised to become one of the first single-estate, seed-to-bottle rye whiskey producers in the country. WhistlePig's owner and founder, Raj Peter Bhakta, an entrepreneur with a dual degree in history and economics, decided he wanted to bring rye whiskey back into popularity (it had been in decline since the Civil War). He purchased a dilapidated, 500-acre dairy farm and set up shop in 2007. Bhakta teamed up with master distiller Dave Pickerell (formerly of Maker’s Mark) and the two hatched a plan to transform the farm into the 1,300 acre distillery it is today. To start, Bhakta and Pickerell produced bottles of ten year whiskey. The whiskey was distilled off the farm, and finished and bottled in Vermont. 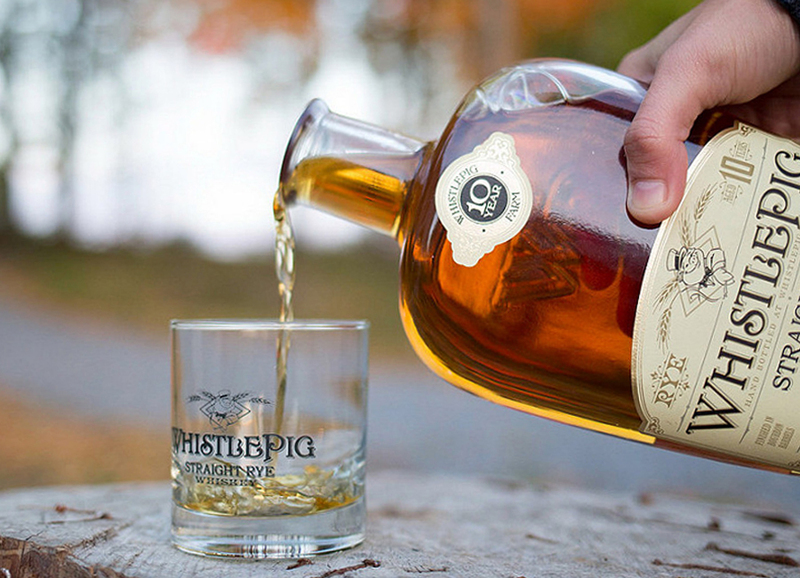 WhistlePig began planting its own crop of rye a few years ago, and recently they have also started to finish the whiskey in oak casks harvested from wood from their farm. To reach its ideal signature smoothness, rye must be aged a minimum of nine years. Its taste is rich and complex, and not at all sweet. In fact, rye contains less sugar than any other grain, giving it a robust flavor with a slightly spicy character. Making it is a long process, and one that definitely requires a good deal of patience. But Bhakta’s determination is bold and his vision steadfast. In doing so, it’s important to Bhakta to position his business at the forefront of sustainable beverage agriculture. And choosing rye is making that easy: the rye is strictly non-GMO, and because it grows so densely, it’s able to exclude weeds, which keeps the need for herbicides to a minimum. It also loves soil-bound nitrogen, making fertilization almost unnecessary. The distillery officially opened in 2015, bringing to life their original vision. But it will still be some time before WhistlePig sells its own farm-to-table whiskey. But when it does, the distillery will make WhistlePig one of the few American whiskey companies to conduct the entire whiskey-making process in one place, from harvesting the rye fields to distilling, barreling, aging, and bottling. The proof is in their product. And it’s unabashedly, one of our favorites.